They say offense wins games, but defense wins championships. 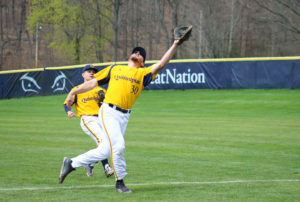 Well, the Quinnipiac baseball team’s defense certainly did not help on Sunday, as it fell to the Iona Gaels 9-4. Four errors for the Bobcats allowed Iona to snap Quinnipiac’s four-series win streak, after the two split a doubleheader on Saturday. The scoring started on an errant throw by freshman infielder Ian Ostberg in the second inning that brought in Iona’s first run. But senior infielder Ben Gibson homered to tie the game back up in the bottom half of the inning. In the fourth, another error by Ostberg on the throw to first brought in another run. Junior outfielder Andre Marrero then bobbled freshman catcher’s Sam Punzi’s single, which caused another runner to score, giving the Gaels a 3-1 lead after the 4th. “[Ostberg] was just rushing himself a little bit,” Delaney said in regards to Ostberg’s botched throw. Punzi then did it again for the Gaels, knocking in two runners on a single in the 5th inning. That chased junior starter Tyler Poulin out of the game, as he was replaced by freshman Arthur Correira. He then proceeded to give up a single to graduate infielder Tyler Bruno as he ripped one into left field. Marrero again misplayed the ball and it went through his legs, bringing in two runs. Senior infielder Sean Scales followed that with an RBI single and Iona took an 8-1 lead out of the 6th. 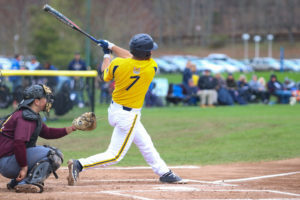 Quinnipiac did respond in the 7th with two solo home runs, as sophomore infielder Evan Vulgamore hit his seventh home run, followed quickly by Ben Gibson, whose team-leading 11th of the year sailed off the scoreboard and cut the lead to 8-3. Punzi added another RBI in the 9th, bringing his total to three on the day and extending the Iona lead. Punzi’s three RBI day brought his season total to 14. Despite a Julius Saporito homer in the 9th, the Bobcats’ comeback would not prevail as it fell 9-4. With three MAAC series’ remaining in the year, Quinnipiac still holds the top spot in the MAAC standings. But Delaney knows changes need to be made offensively. Looking ahead, the Bobcats have matchups against Niagara, Marist and Rider, and the team will look back on this week and do some reflection, according to Gibson. 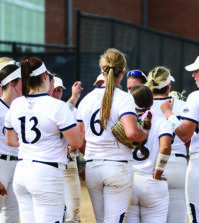 The Bobcats next game will be on Wednesday, May 2 at 3:30 p.m. against Central Connecticut State University in a non-conference matchup in Hamden.